Consumer electronic digital clocks were a novelty in 1977. You couldn’t buy them cheaply. My dad had a digital clock, but it wasn’t a real electronic clock, it was a mechanical clock with rotating drums and lightweight metal plates with numbers on them that flipped over like the departure boards at an airport. My brother, who was also a keen electronics enthusiast in 1977, built a digital clock that used the same clock chip (MM5314) and red 7 segment displays (DL707s /704s). About that time, I built a single digit counter with 7490, 7447 and DL707 combination as an experiment with the new and exciting TTL logic. It sat on the bench endlessly counting. The TTL chips were power-hungry, and in the brief era before 7805 three pin regulators we used a 5 volt 400mW zener and a 2N3055 emitter-follower as a source of 5 volts at hundreds of milliamps. 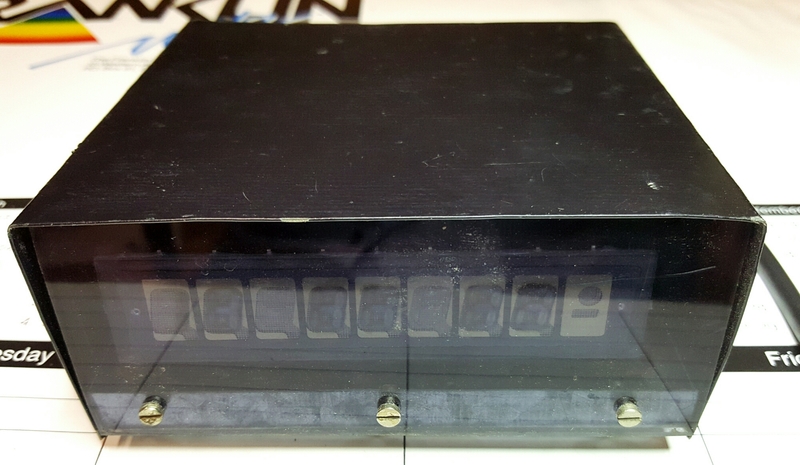 The first TTL digital frequency counters were appearing around this time. They drew an amp at 5 volts and got hot. The clock reveals construction techniques of the time. The thru-hole board is light brown, possibly phenolic material (?). The parts are so strikingly big. The limiting factor was the width of the display, so there was no need to reduce the width of the board behind it. Instructions are screen-printed on the top. NPNs here, PNPs there. Kit builders in those days were less sophisticated, and there were no online forums in which to ask a question. 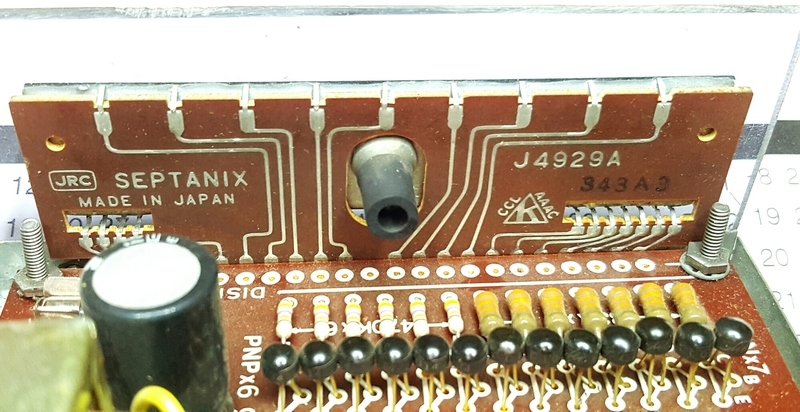 The gas discharge tube is a Japan Radio Corporation J4929A. Here is a page in japanese of old calculator displays, the J4929A is about half way down. 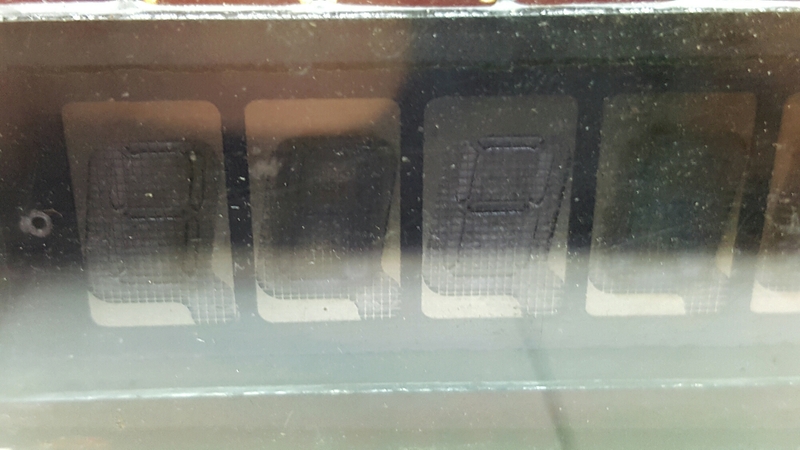 It turns out it was an 8 digit (plus arithmetic sign) display made for calculators. This page in the Calculator Museum tells me it was released in 1973. and was used in the Canon L-811. 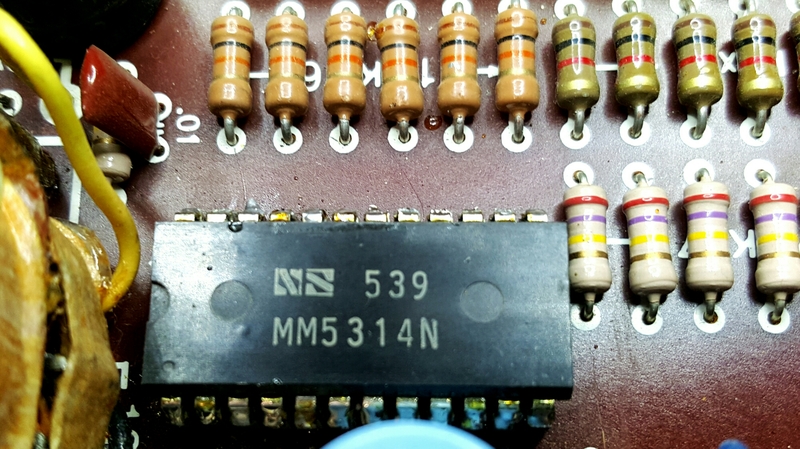 The brain of the clock was its National Semiconductor MM5314. This was a marvel of the electronic age at the time. It had no external crystal clock, rather, it counted pulses derived from the 50Hz mains. To the consumer, it kept near perfect time. Until the power dropped or someone turned off the switch at the wall. When powered up, it flashed 12:00:00 at one second intervals. Who can forget that. You can still buy the chip ($20), pulled from clocks like mine. Even Aliexpress can’t do it any cheaper. You can also still buy a ‘retro 1970s classic’ clock kit, although it uses retro LED 7 segment display, not a gas discharge device like mine, or nixie tubes. It appears that people are using them to drive nixie tubes, to bring a bit of that hipster cafe vibe into the living room. I turned it on, thinking I might run it agai in the bedroom. I don’t need another clock in the bedroom, but I thought it would be a nice nostalgic piece, a token from my boyhood. On power up, it was dead. The mains transformer hummed slightly. But not a photon to be seen. I guess the gas discharge tube finally discharged itself after 40 years. Could I find a replacement? I googled it. Nothing, apart from museum pages. Then I tried eBay. Still nothing. You know you’re in trouble when eBay can’t find what you’re looking for. I’ll put it back in its storage box. Who knows, I might acquire some nixie tubes one day. Postscript: Heathkit, America’s much loved kit electronics company, are back. With digital versions of a few of their famous kit offetings. 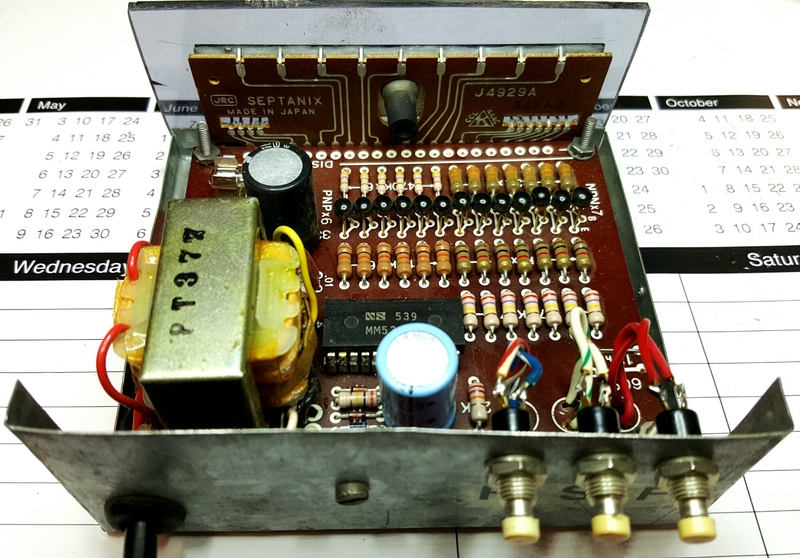 Their first clock kit in 30 years, the Heathkit Most Reliable Clock, has a lot in common with my old piece. Thanks Jim. There are quite a few contemporary updates on clocks using Nanos and RTCs. I built a GPS clock which is a fun take on the classic digital clock. Your 1977 Numitron clock is a pearler! And a crystal time base, a top shelf design in its day I subscribed to your channel, keep the retro clocks coming!. Paul, thanks, I did see that video. I think he is a brilliant individual and I currently have no way to even keep up with his mind. I love his funny little comments along the way in his videos. Along your way, I have to that HAM radio stuff has not grabbed me yet but it has recently grabbed my cousin. He and his son are getting into it. thank you for the reply and comment on youtube. Thanks Jim. I got back into ham radio mainly for building. 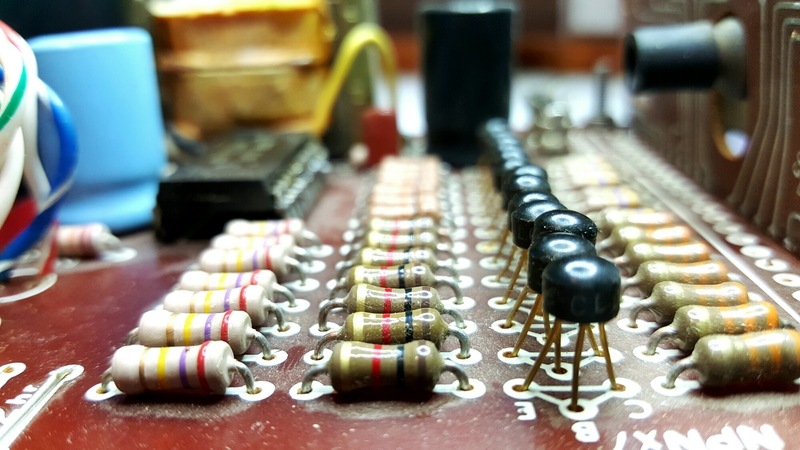 Arduino, the hundreds of digital and analog IO devices now available, and the dirt cheap parts and cards available as a byproduct of the consumer electronics revolution coming out of China’s surplus markets, have made high quality home made radio projects achievable for the home experimenter. And the internet maker communities have exploded with activity and support. I find the Summits On The Air (SOTA) competition is a great way to combine designing and building small simple radios, what we Aussies call ‘bushwalking’ , and being in an active radio enthusiast’s community a good combination. Cheers and keep building.